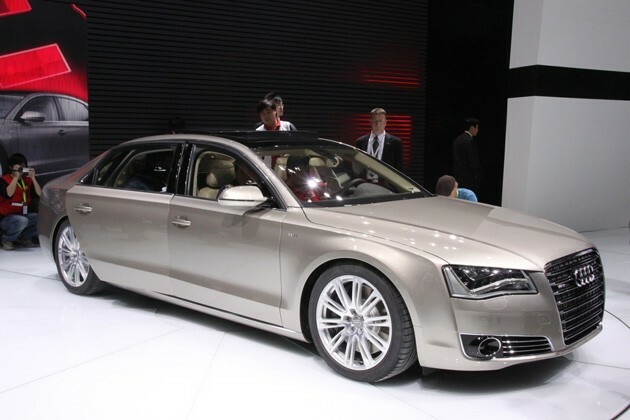 Measuring approximately 17.5 feet long, the 2011 Audi A8 L W12 is certainly quite grandioso. And while the 500-horsepower 12-cylinder engine and new eight-speed automatic transmission are certainly nothing to sneeze at, what's most impressive about the long-wheelbase A8 is the rear seat accommodations. Holy mackerel. You want gobs of leather, a full-length center console, heated and cooled seats that massage you as well as a folding ottoman for premium comfort? You got it. The A8 L's 122.9-inch wheelbase means there's tons of legroom (duh), and we're seriously eager to get some R&R time in the back of this luxury barge. See for yourself in the galleries below. Live photos by Sam Abuelsamid / Copyright (C)2010 Weblogs, Inc.
As impressive of a vehicle as the seminal Volkswagen Phaeton may have been, the uber-luxe German sedan was an unqualified flop of an experiment here in the United States. In some other parts of the world, though, VW's BMW and Mercedes-Benz (not to mention VW-owned Audi) competitor is still going strong. 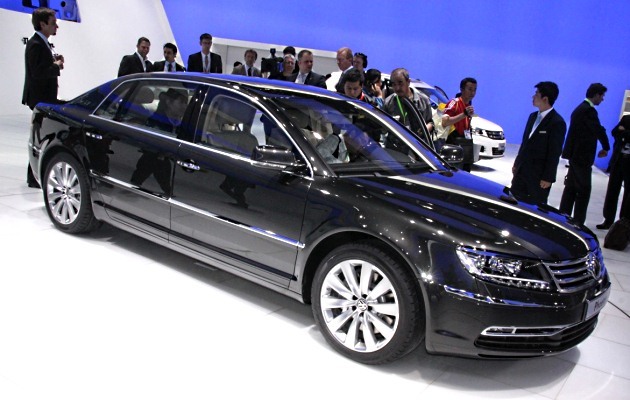 Hence, VW has seen fit to give the Phaeton a mild update for the 2011 model year, and it tellingly used the Beijing Motor Show as the platform to reveal its top-shelf sedan. In case you missed the exterior changes, take a closer look at the front and rear fascias, where you'll find tighter lines and new LED lighting.It's inside the cabin where the Phaeton gets the bulk of its improvements. Included in the refresh is VW's latest navigation technology, along with a helpful seeing-eye camera that can monitor speed limit and no passing signs and inform lazy drivers of the data. There is also a lane-departure system that keeps the car between the proper lines and Dynamic Light Assist that adjusts the headlights to keep from blinding oncoming traffic.Powertrain options remain the same as before, with a 450-horsepower 6.0-liter W12 engine taking top billing over a 335-hp 4.2-liter V8 and a 3.6-liter V6 that puts out 280 ponies. Finally, those looking to save a few bucks at the pump can opt for a 3.0-liter diesel V6. Check it out for yourself in the high-res image galleries below.